These two birds are frequently misidentified in the field and can occasionally be difficult to tell apart even in photos.The Philadelphia Vireo is generally a brighter yellowish-green on the underside and especially on the breast, while Warbling Vireo is mostly a pale grayish-green. 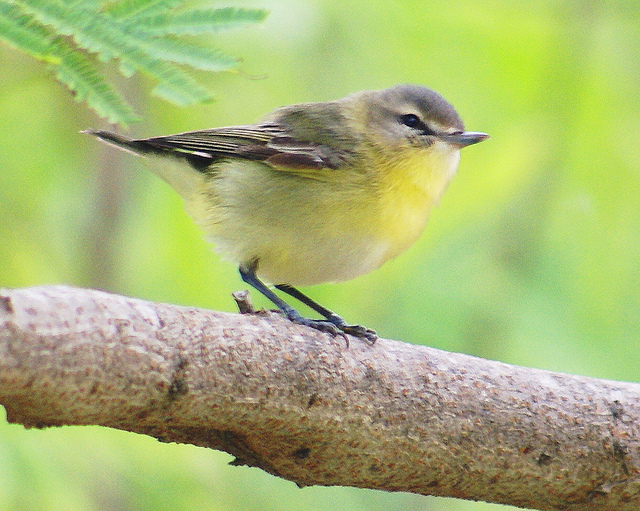 Warbling Vireo may be slightly longer in length, but that can be difficult to determine in the field. Most other field marks on the body are similar. The facial markings are slightly different with the lores of the Philadelphia Vireo being a darker gray, but this can be hard to see when looking up. Status and Distribution for North-central Texas - Philadelphia Vireo is an uncommon spring migrant. It is generally not reported in the fall or may be misidentified with Warbling Vireo. Warbling Vireo is an uncommon spring migrant, rare summer resident around certain area lakes, and a rare fall migrant.